Office hour settings are for your regular days your clients can schedule appointments with you and availabilities are when you need to schedule one-off days and times for things like holidays, vacation days, dentist appointments, etc. Toggle on/off the "Office hours are the same each day"
Click on a day of the week that you would like to set for available hours to be booked. 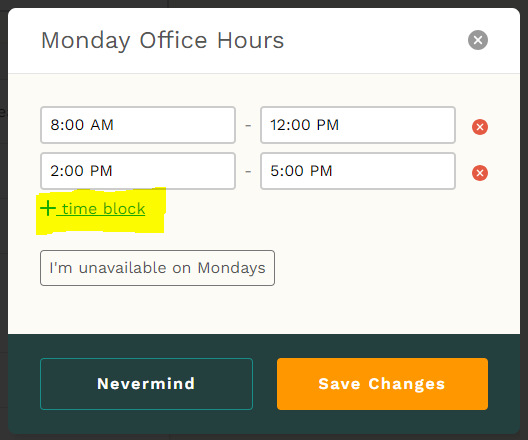 Click on the +Time Block to add your hours of the day. You can add entire days or blocks of time. Note: If you do all of your booking and don't want your clients to see your available days, just click on each day and select "unavailable"
For example: If you are available from 8:00 am - 5:00 pm on Mondays, but take 2 hours off every Monday from 12:00 pm - 2:00 pm, you would create an entry from 8:00 am - 12:00 pm, and then a second one from 2:00 pm - 5:00 pm. 3.) Repeat for each day of the week you are available. I’d love to see my appointments in my personal digital calendar! Is there a way to do this?